Welcome to my Collins KWS-1 & 75A4 Page. 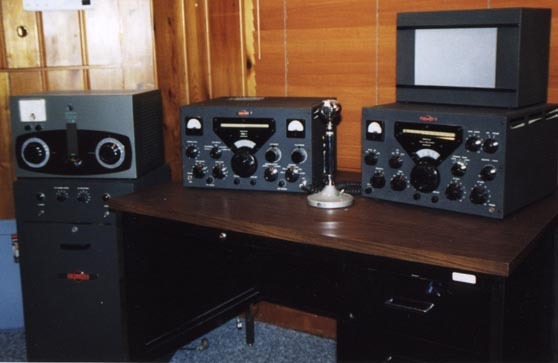 I have included some pictures of my Collins KWS-1 and 75A4 station. I have owned this station for about 4 years, after purchasing the receiver from a ham in California and the transmitter from a ham here in St. Paul. The transmitter seller was located about 5 blocks from my work. I stopped off after work to view it, stopped by the next day with the money to buy it, load it, bring it home, drag it into the basement. Sure beats buying it from across the country and either driving or shipping it. The transmitter is very (!) exciting to have in the shack, to operate, and make contacts with. I enjoy running classic SSB, AM, and CW with this fine rig. I get great AM and SSB audio reports! Interestingly enough, the AM is single sidebanded AM, and most folks can't tell unless they try to zero beat me and notice the missing sideband. AM Audio quality is excellent and only seems to drop after someone notices the missing sideband :) I run an Astatic 10DA microphone. You know, when I flip the high voltage switch on this transmitter, with the filament and plate voltage jewels glowing red and green, and the blower sound as it trys to cool those 4x250's, and the look of the large transmitter, it feels like I am running 100,000 watts. Its just gotta give me an extra 12 db just from the "cool" alone. 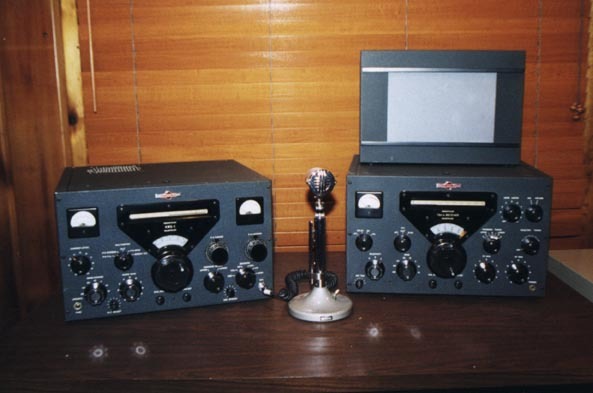 Here is a pictures of my Collins KWS-1 transmitter (left) and Collins 75A4 receiver (right), Collins 270G3 speaker sitting on top of the receiver. The power supply is not shown. Boy I sure would love to find the matching 312A-1 speaker for this rig. 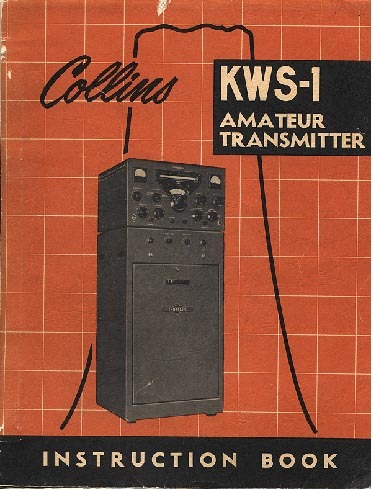 Here is another angle picture of the Collins KWS-1 transmitter and Collins 75A4 receiver. Note the KWS-1 power supply sitting on the floor to the left of the desk. A Johnson Viking KW Matchbox antenna tuner is sitting on top of the power supply. Here is a picture of the "Gold Dust Twins" in a stacked position. Starting on top is the 270G3 speaker, next down is the 75A4 receiver, next is the KWS-1 RF deck, and on the bottom of the pile is the KWS-1 power supply. The RF deck contains the exciter and power amplifier. The rf deck is approx 17" wide, 10.5" high, 15.5" deep, and weighs 50 pounds. The power supply measures 17"wide, 30" high, and 15.5"deep, and weighs 173 pounds. Total weight of the transmitter and power supply + receiver is close to 273 pounds, so you see why they call this old tube equipment "boatanchors".